Insomnia--difficulty falling or staying asleep--is a common response to stress, anxiety, depression, and other conditions. It may be short-lived and resolve quickly or become chronic and disturb your life and well-being if the underlying problem persists. Improvement in sleep comes from managing the cause of the insomnia. Acute stress leads to an increase in your stress hormones, such as cortisol and adrenaline, disturbing your sleep pattern. These hormones can stay chronically elevated and cause long-term insomnia as long as the stress continues. Insomnia itself can be a big source of stress and set up a chronic stress-insomnia cycle. To prevent stress-related insomnia, actively manage your sources of stress by changing what you can. Otherwise, learn ways to cope with stress to improve your sleep quantity and quality. Coping recommendations include eating right, adequate exercise, meditation, or other and stress management exercises, such as passive muscle relaxation and mindful deep breathing or visualization. A warm bath or yoga before bed can also reduce stress and help you sleep. Anxiety is another common cause of insomnia. An underlying anxiety disorder might be the cause, or the anxiety might be a response to general stress. According to the Anxiety and Depression Association of America, anxiety can disturb sleep. On the other hand, chronic sleep deprivation can cause anxiety. Whatever the cause, people with anxiety may feel more anxious at night and have difficulty falling or staying asleep. As with stress, you can help your anxiety by eating healthy foods and increasing your physical activities. Practice relaxation techniques to help reduce anxiety and prevent insomnia or other sleep disorders. Behavioral therapy or anti-anxiety medicines, if necessary, can also help you get better sleep. Depression and other psychological problems, such as bipolar disorder and post-traumatic stress disorder (PTSD), are also common causes of insomnia. According to Psychology Today, insomnia often accompanies depression, and insomnia can lead to depression or other psychological disturbances. As you lie awake thinking of your problems, you get into a cycle of further depression, anxiety, and insomnia. Treatment of the underlying cause of the depression or psychological problem can help prevent or improve insomnia. Behavioral therapy or psychotherapy helps many people cope and sleep better. Others might be helped by adding an anti-depressant to the strategy. 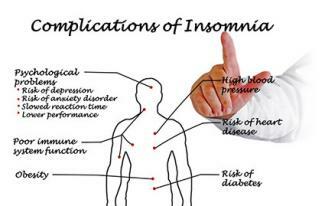 Some of these problems cause sleep apnea, which disturbs sleep and can lead to insomnia. Treatment and improvement of the underlying medical condition can help prevent insomnia. Some people may resort to prescription or over-the-counter (OTC) sleep medicine. Check with your doctor first before you take any OTC sleep aids or herbal preparations if you have a medical condition, such as high blood pressure or heart disease. Before you take any medicine, make sure you understand the side effects. Do not take a bigger dose or take it more frequently than prescribed. If your insomnia is disrupting your life, you may need to to stop taking the medicine or use an alternative drug. Habitual use of common substances can cause insomnia, depending on the extent of use. Caffeinated drinks, such coffee, tea, soda, or energy drinks are stimulants. They can cause insomnia and other disruptions in sleep quality, according to an article on caffeine and sleep by the National Sleep Foundation. For some people, this is even worse if they use these drinks close to bedtime. The nicotine in cigarettes and other tobacco products act as stimulants, which can disturb sleep. An analysis of multiple studies on nicotine and sleep published in Sleep Medicine Review supports this conclusion. Although it is sedating, alcohol can disturb the quality of sleep and cause episodes of insomnia. In a study in the American Journal of Psychiatry on alcoholism and insomnia, more that 60 percent of alcohol users entering treatment reported insomnia. They were more likely to relapse to alcohol use than those without insomnia. To prevent insomnia or improve your sleep quality and quantity, limit or avoid stimulant drinks, alcohol, and tobacco. If you continue these habits, limit or don't use these substances close to bedtime. Abuse of illicit substances, such as heroin, opiates, and stimulant drugs like methamphetamines can disturb sleep and lead to insomnia. A small survey from the Cleveland Clinic on sleep disorders in substance abusers was reported in 2009 in the journal Psychiatry. Fifty-six of the study patients reported problems with insomnia. People who develop physical dependence on their drug of abuse may also experience insomnia as part of the withdrawal syndrome when they abstain from their substance. If drug abuse is affecting your sleep, your insomnia may improve after withdrawal, detox, and rehab. Long-term rehab treatment of the drug abuse or addiction using medications, behavioral therapy, and support services can help prevent chronic insomnia. Sleep disturbance and insomnia can come from a change in your work, travel, or regular sleep schedule. These changes can disturb your body's internal clock (circadian rhythm), which is set to the natural day-night cycle. Prolonged exposure to bright, artificial light during the day or night because of a school or work schedule can also disrupt the normal sleep-wake cycle and cause insomnia. Neurotransmitters in the brain such as melatonin, norepinephrine, and serotonin control the cycles of wakefulness and sleep. Changes in schedule likely cause disturbances in these hormones resulting in disrupted sleep and insomnia. Over time, your internal clock may reset to match your new schedule and correct your insomnia. Otherwise you might need to adjust your schedule or to seek help for treatment. Light therapy to reset your sleep cycle to match your work or travel cycle can often help. You can prevent insomnia and get better sleep each night by keeping a regular sleep schedule. Avoid stimulating activities and a big meal before bed. In addition, create a peaceful sleep environment, including having a comfortable bed. Relaxation habits such as deep breathing, meditation, self-hypnosis, or yoga can help wind you down for bed. Hours of looking at bright screens at night, such as a computer monitor, laptop, tablet, television, or cell phone, can make it difficult to fall asleep. It is thought that the blue light from the LED backlit screens mimics daylight and disrupts the natural transition of brain hormones that bring on sleep. This is also true for eReaders, as found in a Harvard study published in 2014 in the Proceedings of the National Academy of Science. The longer the exposure the more the disruption in sleep. As noted by a Scientific American brief review, the primary cause of sleep problems that can lead to insomnia is the interference of this light with melatonin, the hormone of sleep. Melatonin release is pegged to the circadian, day-night/wake-sleep cycle and increases with the onset of darkness to induce sleep. Exposure to these sources of light can delay the onset of sleep by delaying the normal rise in melatonin at night and play havoc with your circadian rhythm and sleep pattern. By understanding this connection between bright screens exposure and insomnia, you can take steps to decrease its effect on your sleep. Avoid or limit your exposure before bedtime by turning down the brightness on your screens so you can get sufficient sleep. If you wake up during the night, try to avoid using any devices with bright lights so it is easier to get back to sleep. There are causes of insomnia associated with natural transitions in women only. The insomnia may or may not be linked to hormonal changes. 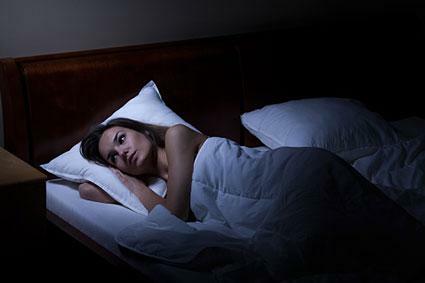 WebMD notes some women complain of insomnia and other sleep disturbances especially just before and during their period. This is more common in women who have symptoms of the premenstrual syndrome, such as bloating and pelvic pain. Progesterone promotes sleep; however, it is not clear whether the sleep problems are related to the lower levels during those phases of the cycle. Insomnia is one of the sleep disorders of pregnancy. It may be related to hormonal, physiological, and physical changes during pregnancy. Insomnia may be more common in the late second and third trimesters as the discomforts of pregnancy worsen. During the transition to menopause (perimenopause), women may have episodes of insomnia according to the National Sleep Foundation. This is likely due to the hot flashes, flushing, or sweating caused by falling or fluctuating estrogen levels. As reviewed by the Journal of Clinical Sleep Medicine, lower progesterone levels and an increase in disordered breathing after menopause may also explain the sleep disruptions. Exercise and activities that promote relaxation such as yoga, meditation, imagery, or self-hypnosis can help all three circumstances. Sleep disturbances during menopause can resolve with time or by using hormone replacement therapy or antidepressants to treat the hot flashes. Prevention of insomnia and improvement in sleep quality can come from increasing physical and mental activities, addressing underlying problems, and getting behavioral or social support. If you are feeling stressed, anxious, depressed, and low on well-being, and sleep deprivation interferes with your ability to function, discuss your insomnia with your doctor. He can evaluate you for underlying causes and discuss helpful medical and behavioral solutions or prescribe a sleep aid if needed.